Two members of world-famous US soccer team LA Galaxy were special guests at Action for Children’s Hackney Young Carers service today (Tuesday 17 February). The team’s president Chris Klein – who appeared for LA Galaxy in more than 100 games – ran a football skills session for a group of young carers aged between nine and 13 years old, while LA Galaxy’s manager of sports science and nutrition expert Alex Savva joined the children for a special cookery class. 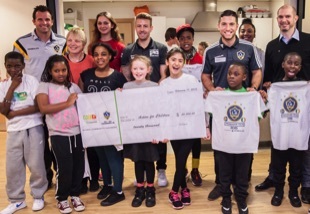 LA Galaxy – the most decorated team in US Major League Soccer (MLS) and famous for its signing of former England captains David Beckham and Steven Gerrard, as well as stars such as Robbie Keane – donated US$20,000 to Hackney Young Carers through its partnership with global nutrition company Herbalife. Chris and Alex – who had flown to London from Ireland, where the US soccer team is currently in pre-season training – also presented the youngsters with their own LA Galaxy tour t-shirts. LA Galaxy was recently honoured by US President Obama for its work with its communities – and through its relationship with nutrition company Herbalife, it works to take that same ethos with it when it travels. Vera Beining, Service Manager of Hackney Young Carers, said: “We were all delighted to have such an inspiring visit from LA Galaxy. The children were thrilled to get the chance to play football with a US soccer star, and to hear about the importance of nutrition from such a high-profile expert. Hackney Young Carers supports children and young people who have caring responsibilities for a relative with a long-term illness or disability. Young carers take on a huge burden of responsibility through their caring role. As well as daily tasks such as housework, cooking and cleaning, they live with the added pressure of school and sometimes a lack of understanding from schoolmates. Many young carers lack the skills to shop for healthy ingredients and to cook nutritious, wholesome meals for themselves and their families. In Hackney many of these young people have limited budgets for food, and so turn to the false economy of fast food for meals. With Herbalife’s support, Action for Children’s healthy eating and lifestyles programme educates young carers about nutrition. Alongside gaining practical skills to cook healthy meals – from chopping vegetables to understanding nutrition labels – the young people benefit emotionally and socially from regular cookery classes, which offer opportunities for them to socialise with other carers and to enjoy a break from their caring duties. For more information about Hackney Young Carers service, which is based on Ashwin Street in Hackney, please call 020 7254 5554.